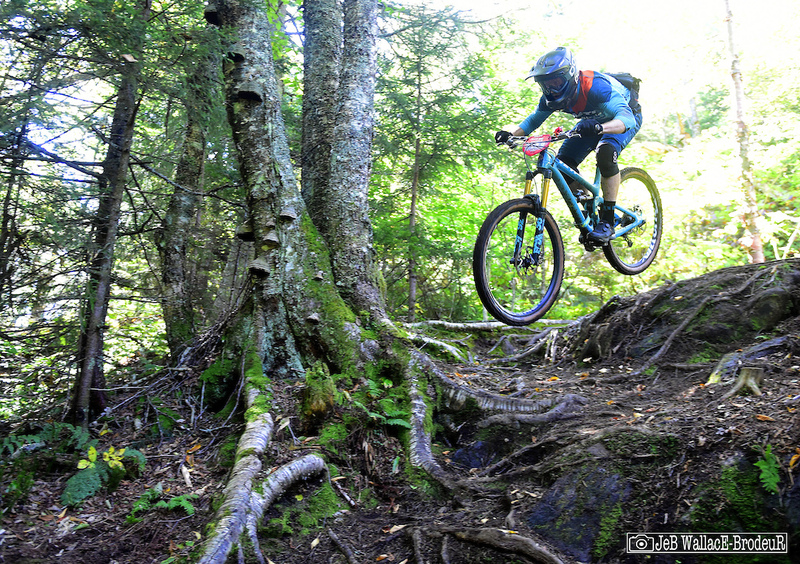 The figurative stage was set, as were the literal stages, this past weekend as a couple of North America's biggest enduro series converged for a grueling finale in the forest-clad mountains of northern Vermont. 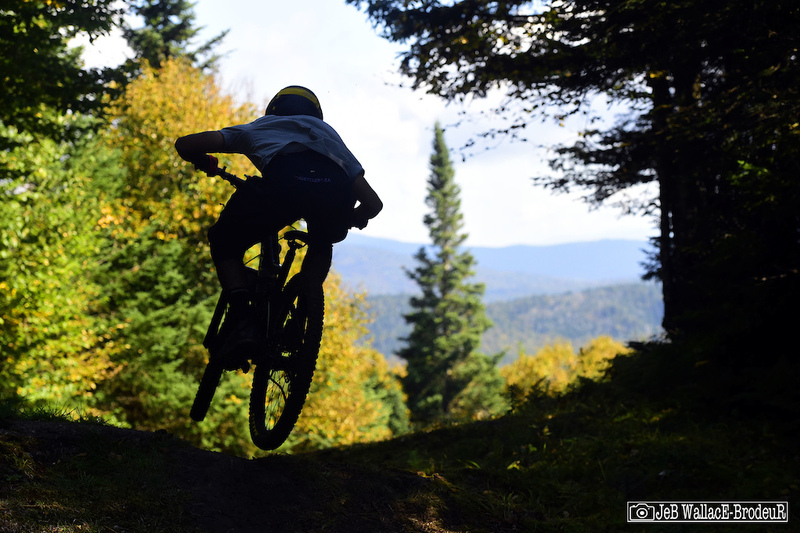 The inaugural Enduro World Series North American Continental Championship and the CLIF Enduro East Championship were decided over two days of racing on Victory Hill and Burke Mountain in a corner of Vermont that has become one of the hottest biking destinations in the country. 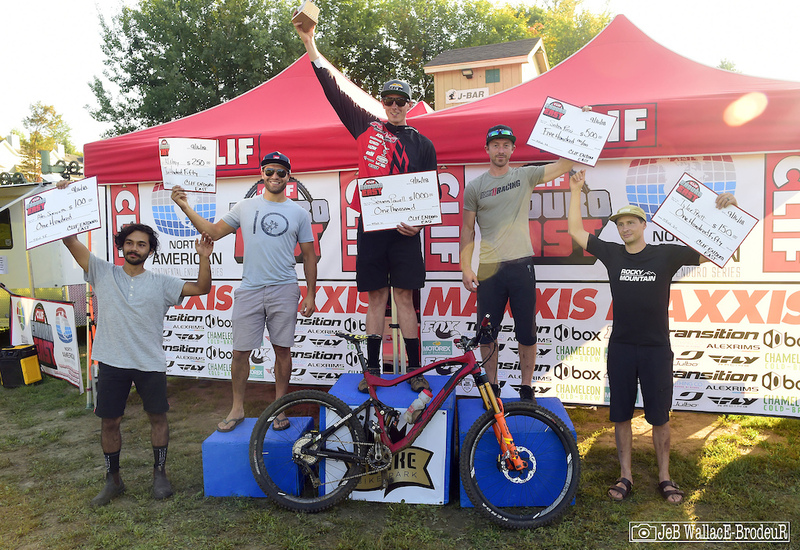 With back to back wins at the first two EWS North American series stops at Aspen and Northstar, Richie Rude came into the finals as the clear favorite. He also came with the large target on his back that comes with such success and numerous racers had their sights set on the front runner. Californian Amy Morrison came to the event as the women's leader on the strength of two runner-up results. 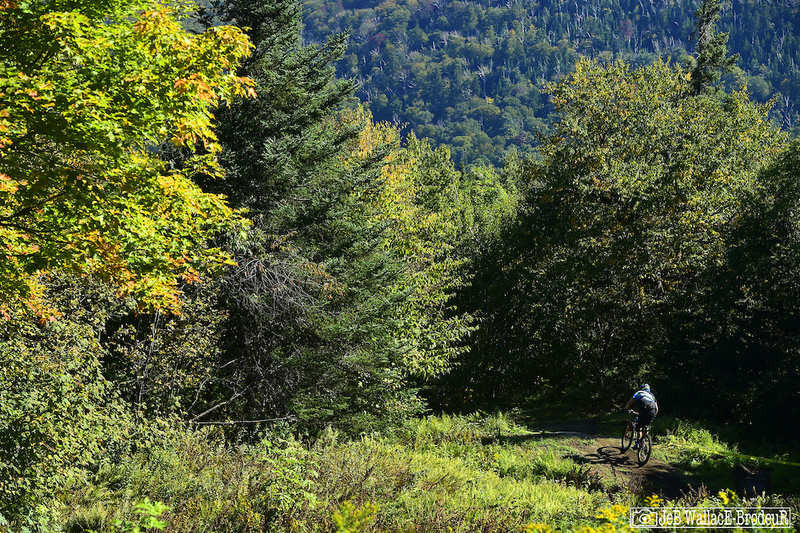 Morrison had never raced in Vermont so the classic New England stew of mud, roots and rocks posed a big challenge for the west coast woman. The event also marked the return to racing for former World Cup downhiller Alison Zimmer after a four-year hiatus and it was anyone's guess what she would bring to the table. 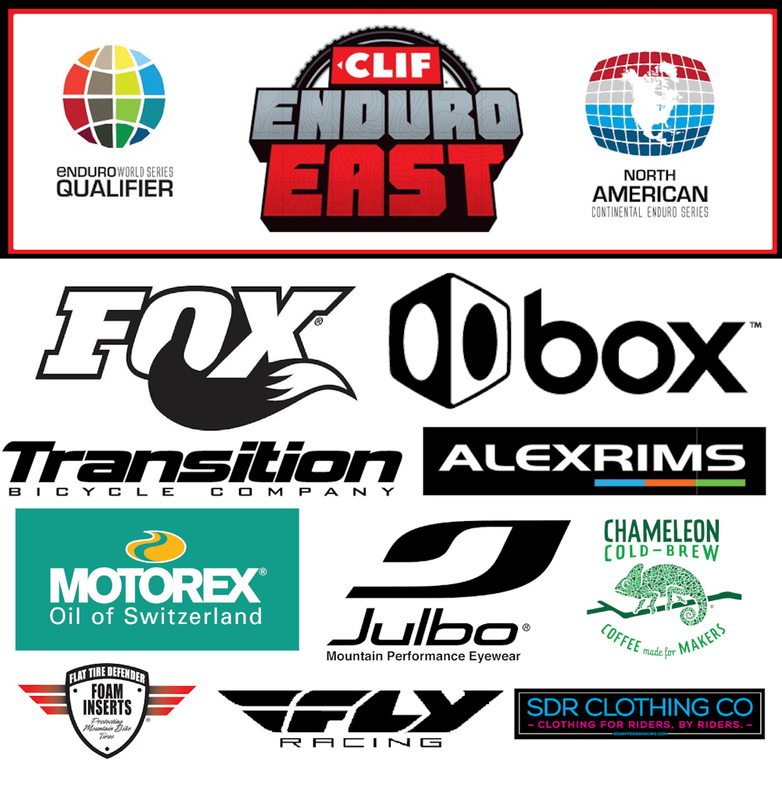 The CLIF Enduro East series, now in its second year offering EWS qualifying events, also came to a head at Burke. 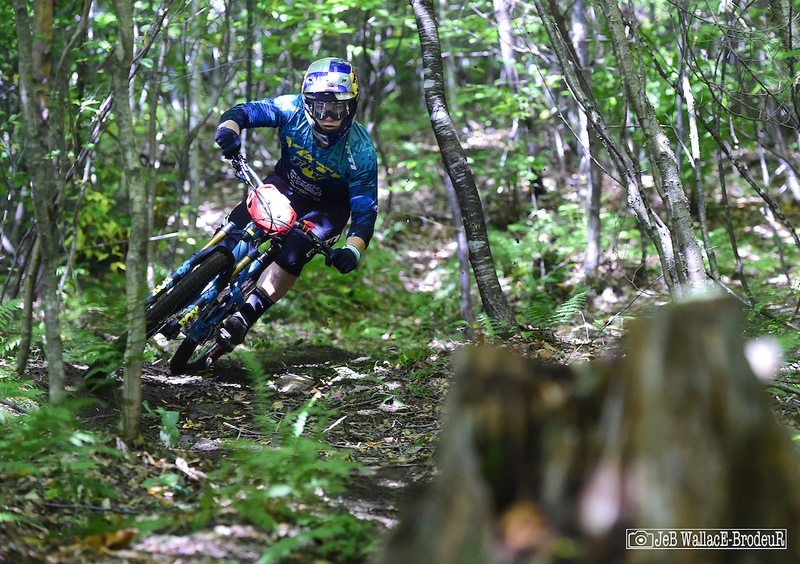 Following a couple tough two-day events at Mountain Creek and Thunder Mountain, reigning US National Enduro Champion Seamus Powell entered the weekend with a scant five point lead over Maine native Saben Rossi with AJ Nagy just another five points back. 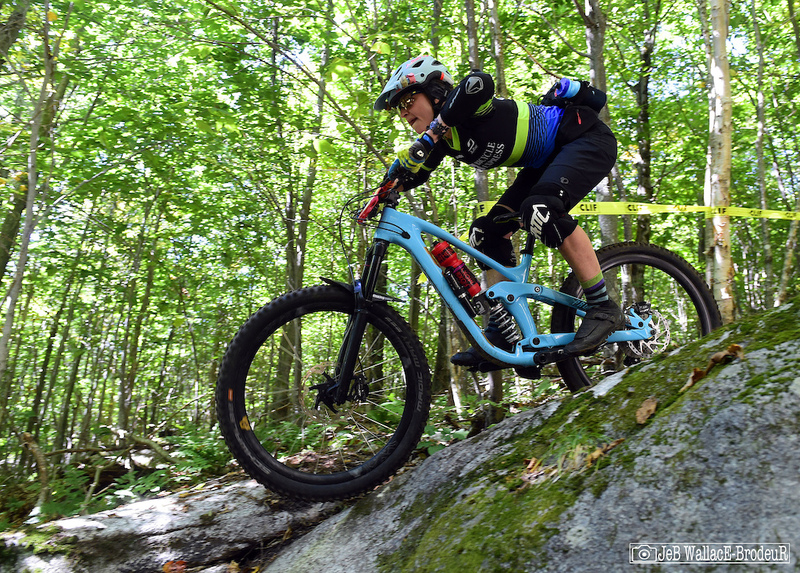 On the women's side Rosy Metcalfe held a similarly small points margin over fellow Vermonters Kim Quinlan and Sarah Howerter. It would take two days of monster climbs and descents to sort out who would take home all the marbles. 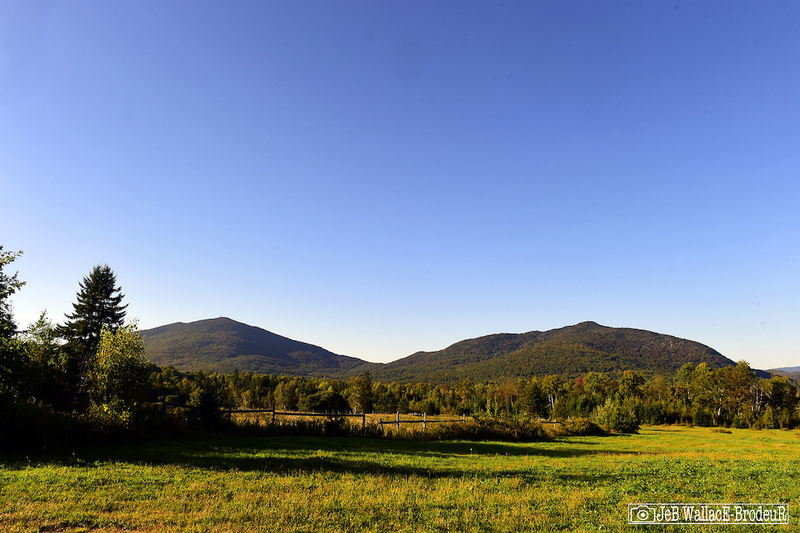 Burke Mountain (left) and Victory Hill dominate the landscape in a particularly wild area of Vermont known as the Northeast Kingdom. Burke Mountain is home to an alpine ski area and an Olympic-level training center at Burke Mountain Academy, a residential high school that has produced many ski luminaries such as Olympic gold medalist Mikaela Shiffrin who graduated in 2013. 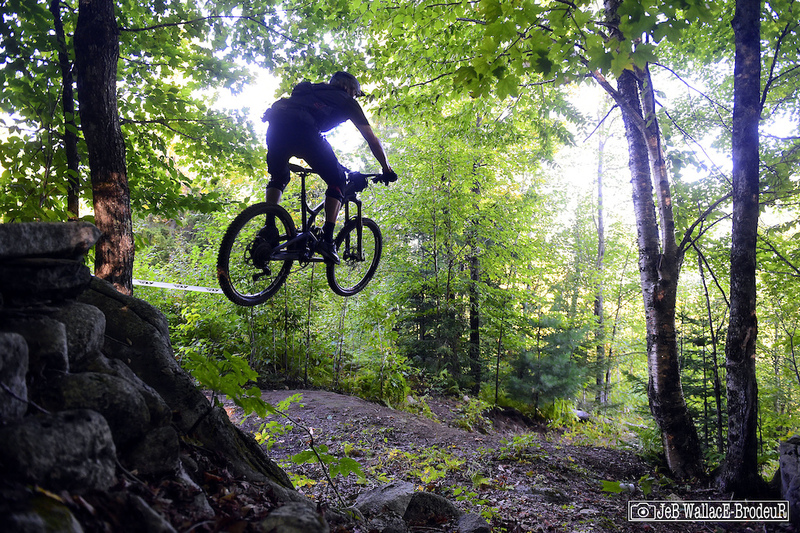 In the summer it's home to a growing lift-serviced bike park and a handful of rowdy trails that drop from its 3,271-foot summit, high above the bike park. Victory Hill is a newer zone that has been developed in the past few years. Though a close-neighbor in location, Victory couldn't be further in ambiance from the resort-vibe at Burke. Victory offers no facilities (unless you count a lone porta-potty as a facility) and can pose a true navigational challenge if arriving by car (one of the most popular route options requires miles of driving on a single lane, unimproved fourth-class road). What Victory does offer is a fantastic and growing trail network that combines old-school gnar with new-school machine-built berms and features. The two-day event was a big test for riders and featured eight stages with no lift assist and more than 10,000 feet of transfer climbing. Total race time exceeding an hour for all but the fastest pros. The look on Brett Severson's face sums up the effort required to get through this battle in one piece. 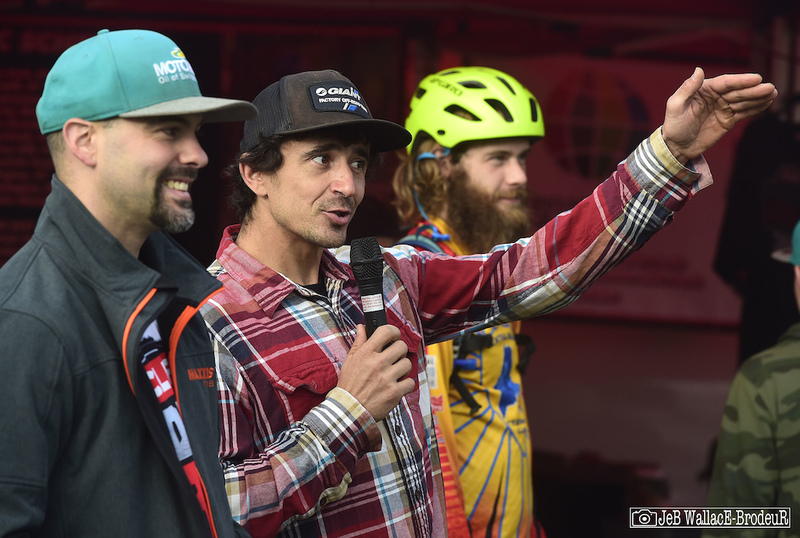 Saturday started off with an early-morning riders' meeting with Adam Craig representing the Enduro World Series and Chris Gilbert, left, representing the CLIF Enduro East series. After some advice, explanations and rules warnings riders were sent off to tackle the opening many-mile transfer from the base of Burke Mountain to the flanks of Victory Hill. Stage one began a few hundred feet below the high point on Victory Hill. Team Granite's Tucker Nugent took home a top-thirty finish. The fastest racers earn much of their advantage in the corners and watching Fox/Yeti factory rider Richie Rude slalom through the trees on Stage Two one could see the seconds advantage being put on most of the field. Despite losing tire pressure due to a dented rim on stage one, Rude still won the opening stage by more than six seconds and also took stage four by a whisker. Day one was to be no cake walk for Rude though as Vermonter Adam Morse also won a couple stages to finish the day just two seconds back. Victory Hill offers a wide variety of riding options including some big features like this intimidating step-down into a corner hit by Andrew Sampsell near the conclusion of stage two. Local speedster Alex McAndrew has been out of commission for much of the season after an injury suffered at the EWS stop in Chile. McAndrew's race pace and confidence were back and he was sitting third behind Rude and Morse after taking the final stage of the day. 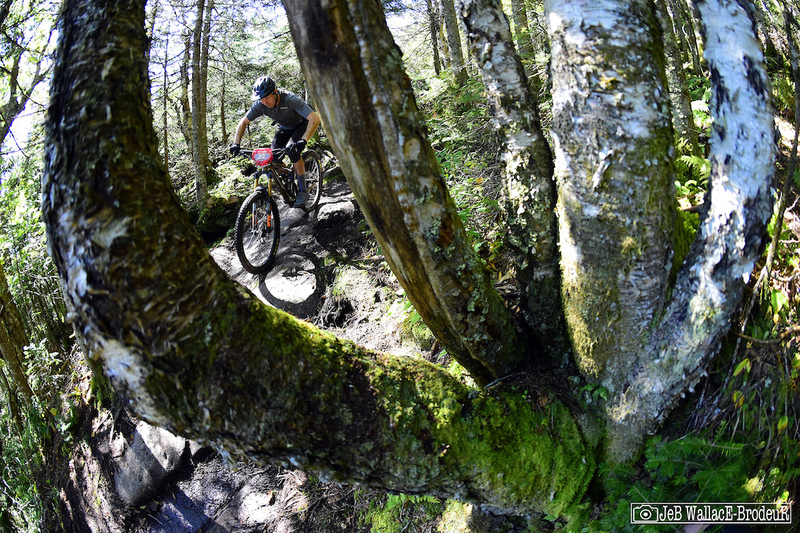 Most of the trails racers were enjoying over the weekend were the fruits of this man's labor. 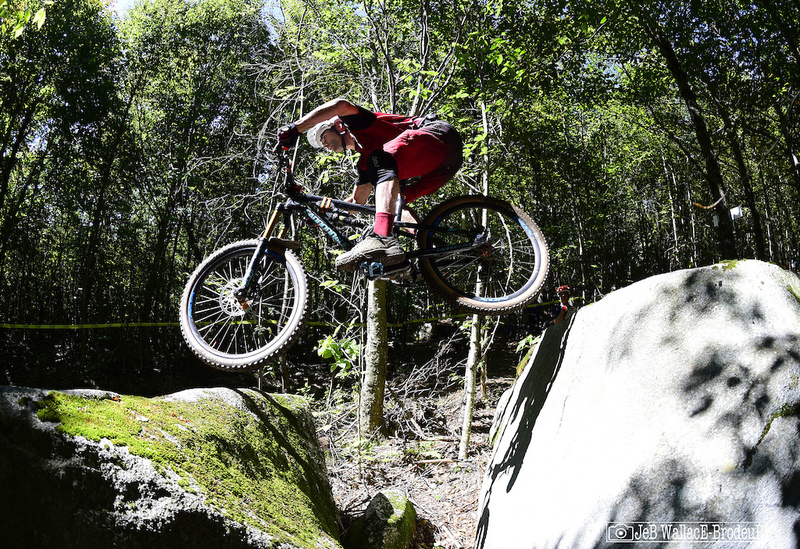 Knight Ide has been building trails in the region for years and is well-known in the bike world for his single track creations (including this recently unearthed rock double on stage three) as well as his passion and good spirits. 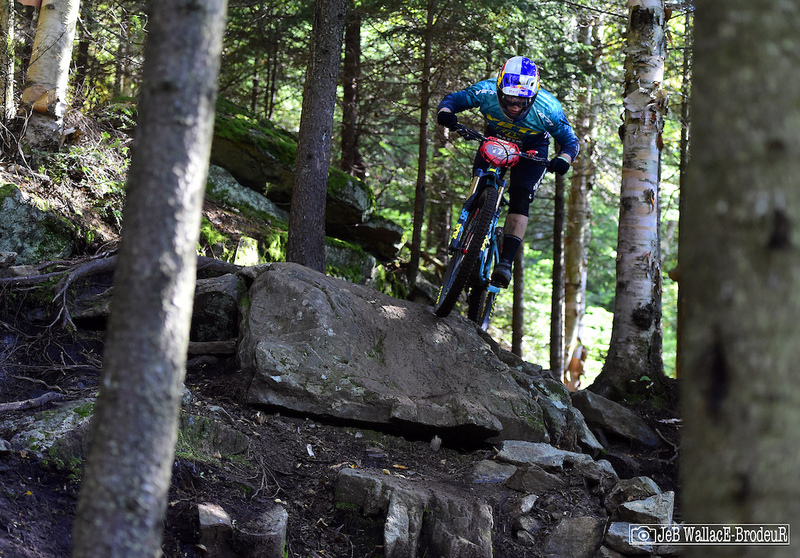 Ide is also a fast rider, earning a 20-second victory on stage eight and finishing second overall in the EWS Masters class. 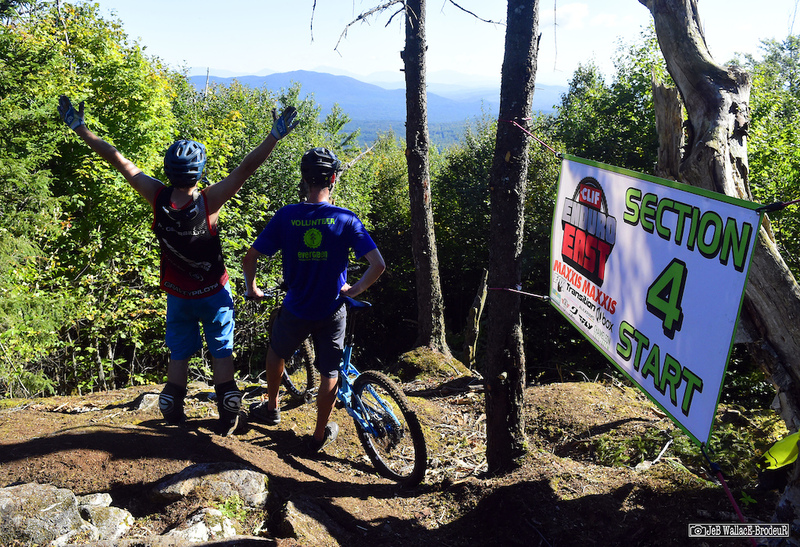 One of the newest additions to the Victory Hill network took racers to a new high point and the start of stage four. 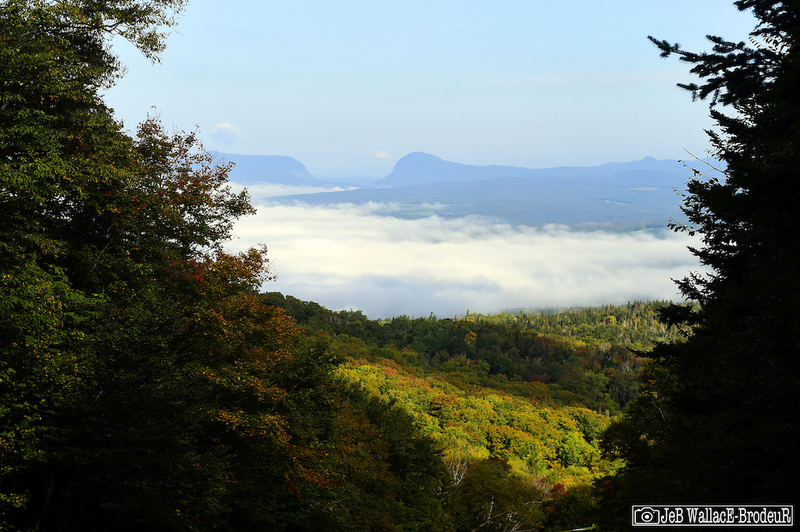 The final stage at the venue was the longest of the day with a 1,200 foot descent over several miles. 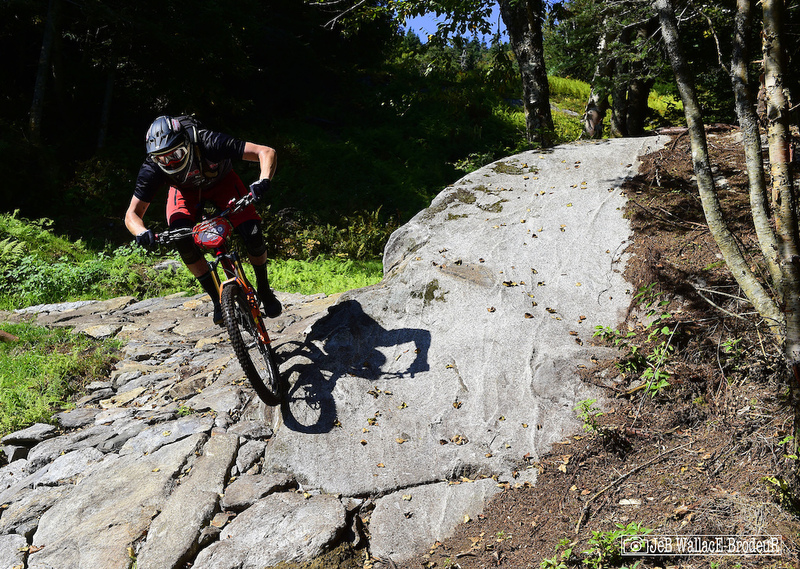 Tom Sampson cruised along one of the many rock features on the final Victory Hill stage. Sampson would land just outside the top ten when the dust had settled Sunday. 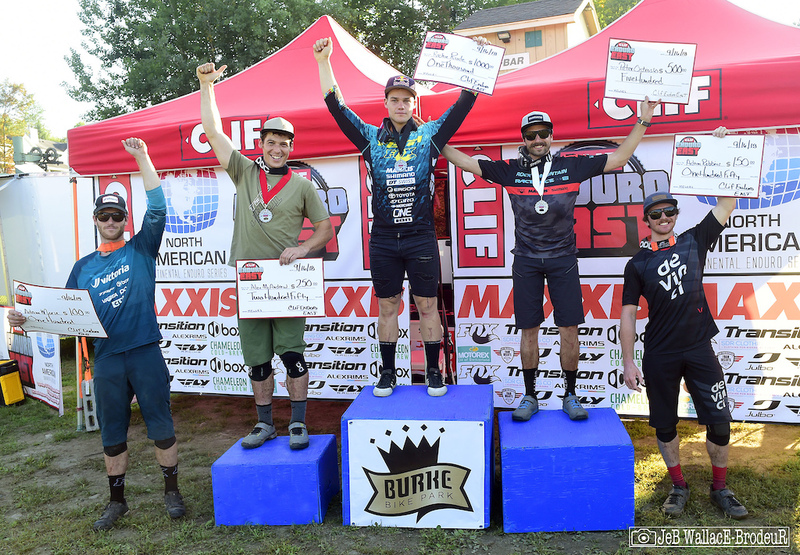 Luke Hursh won five of the seven amateur stages to take the men's amateur title (the non-EWS classes got to skip stage four on Saturday). 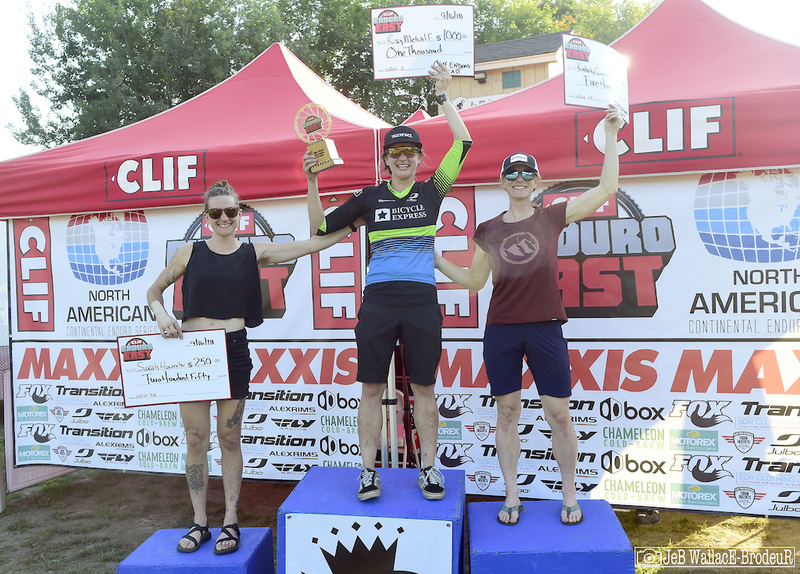 Bicycle Express pro Rosy Metcalfe won stage six and her fifth-place overall finish was just enough to secure the CLIF Enduro East championship. 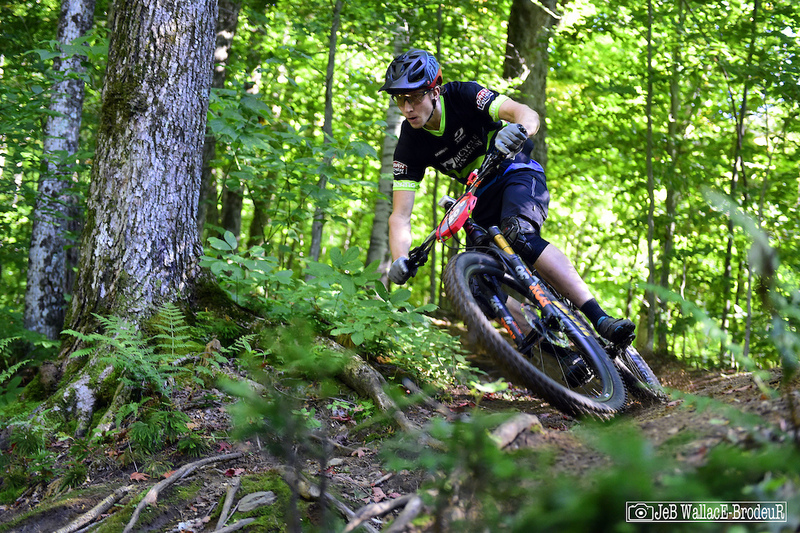 Metcalfe's Bicycle Express teammate Emmett Avery was an absolute beast over the weekend, dominating the EWS U21 field with six stage wins. 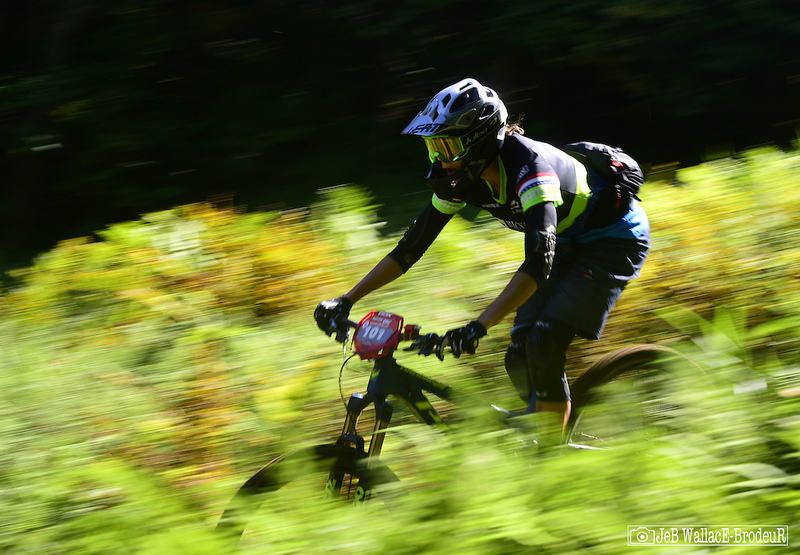 Avery is heading to Italy to compete in the EWS finals at Finale Ligure in a couple weeks. 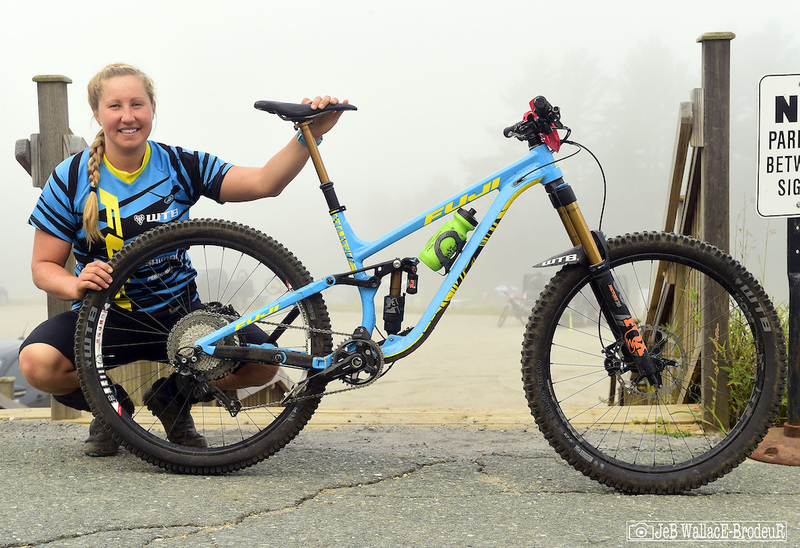 With day one in the books, lets take a look at Amy Morrison's race steed. Fuji bikes are better known as a budget brand for families but they are starting to make strides in the high-performance arena, and Morrison and teammate Jimmy Smith's results show they are succeeding in their efforts. 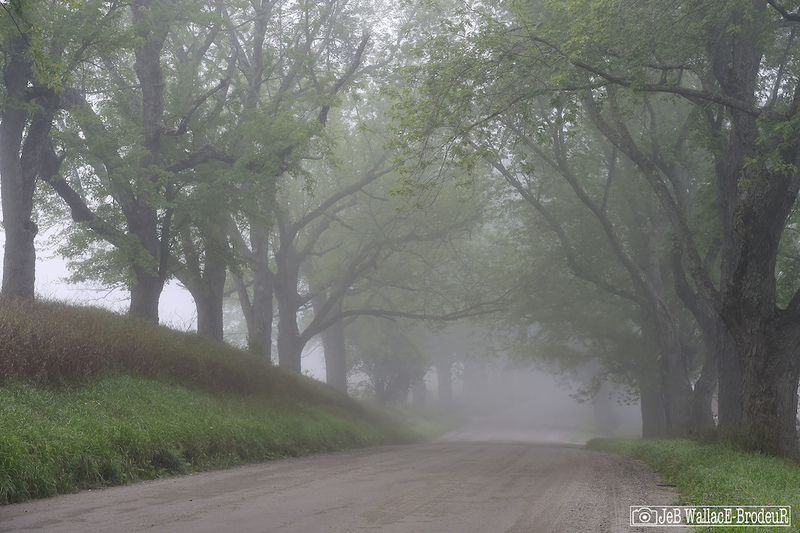 Day two began with the area blanketed in fog, a muted start to another day of high-octane racing with perfect late-summer weather. While day one was a marathon with five stages combined with transfers to Victory Hill and back, day two was a whole different beast all together. 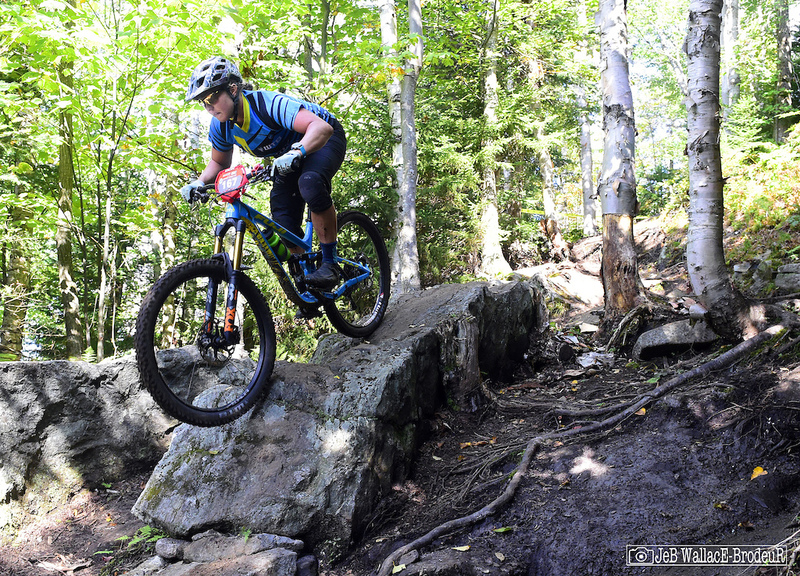 The racing took place on the front side of Burke Mountain and had a distinctly downhill flavor. Full face helmets replaced Saturday's half shells. Stage six was the longest of the event, taking the fastest riders more than 10 and half minutes to complete. 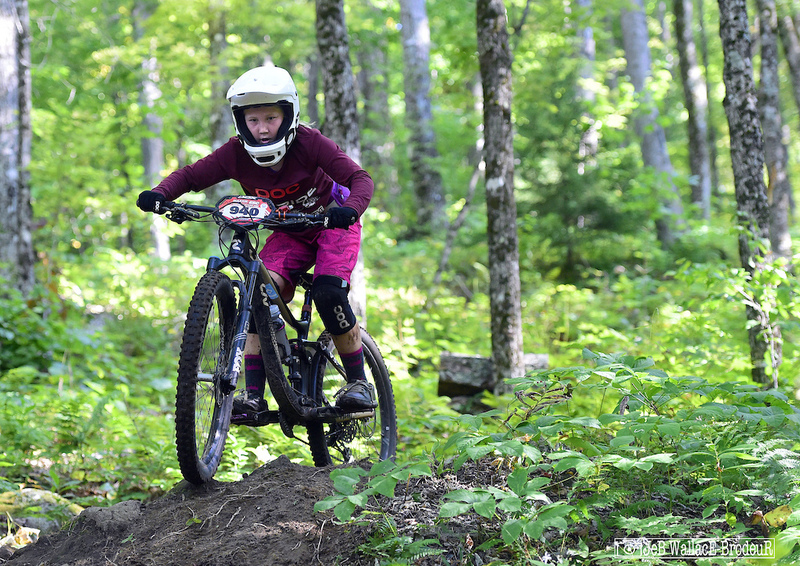 After a 2,000-foot vertical climb to the summit, racers faced the newly rechristened Rude Awakening (formerly the DH trail). If you haven't seen Richie Rude's RAW 100 video shot on this trail, do yourself a favor and give it a look. While the first day offered prime conditions, the top of Burke Mountain never seems to dry out. 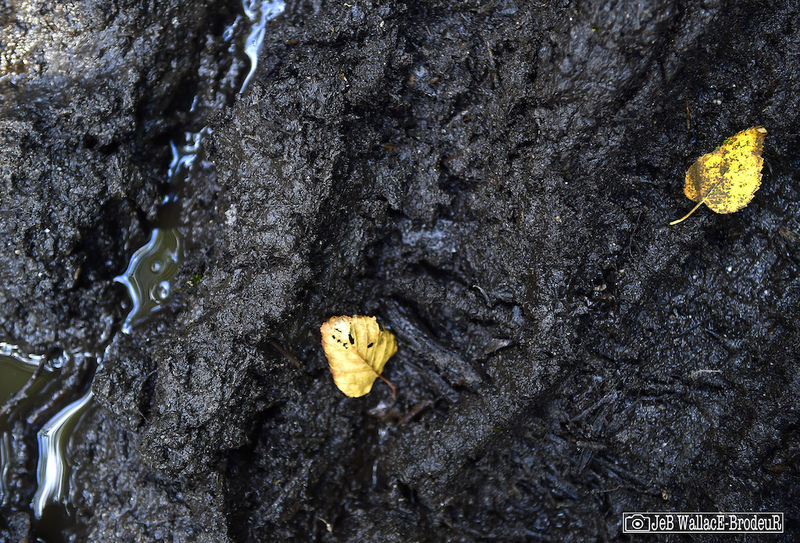 Layers of moss hold in the moisture like a sponge and wet seeps are everywhere even if it hasn't rained for days. A Rude Awakening it was for racers still stiff and sore from the first day's 25-mile effort. 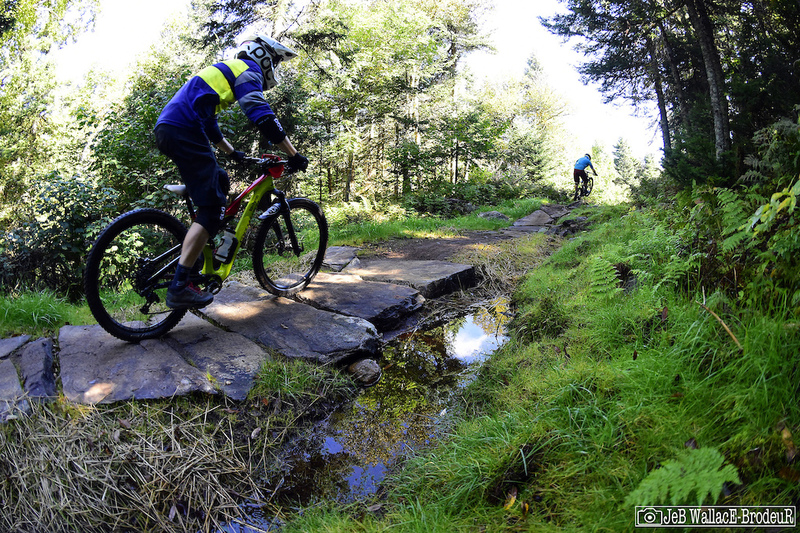 The trail runs the gamut from awkward rock features to rotor-burning plunges. 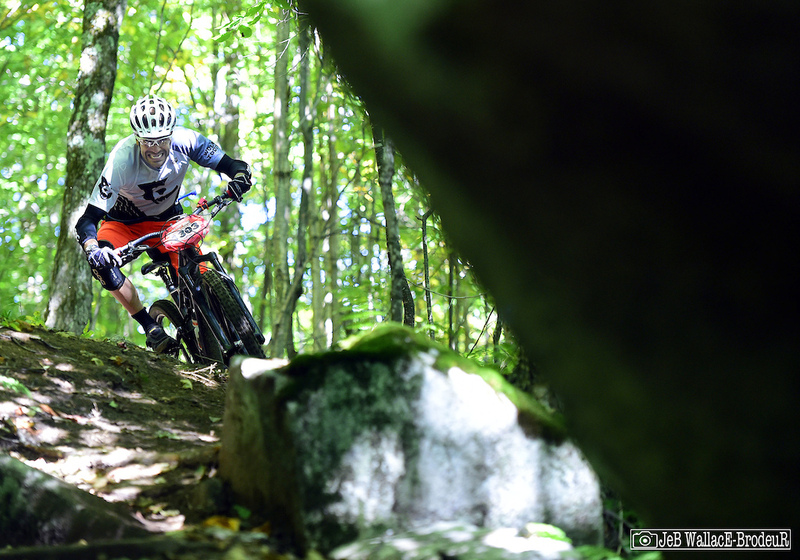 Chris Miller turned in an impressive top-ten finish in the EWS men's field. 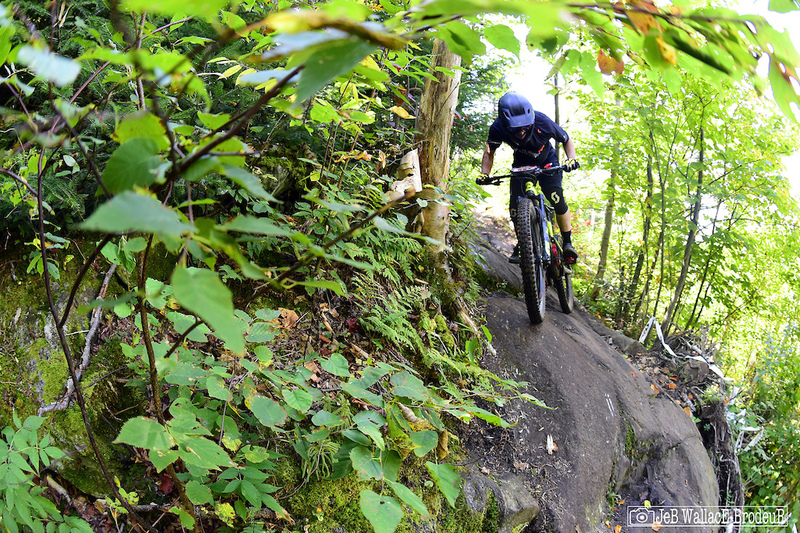 The trail has gotten a heap of maintenance love this summer with some rerouting, lots of drainage work and the installation of this impressive rock berm engineering marvel. USAC National Enduro Champion Seamus Powell finished just off the podium in sixth place. Powell clipped and bent a pedal and broke his dropper lever off during a high-speed crash on stage two so was pleased with his result on a compromised bike. About a minute into the epic stage and there's a lot of trail to go. While Richie Rude has no weak spots, there is no doubt that the more gravity oriented stages play to his strengths. Rude put six seconds into the field on the first two stages Sunday and took the overall win by a 28-second margin. 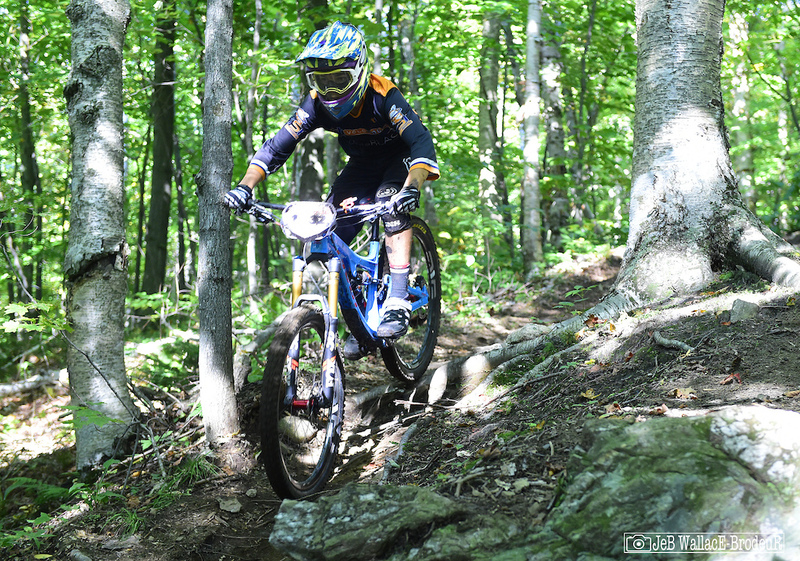 Rude also won the EWS Continental Championship going away with three straight victories. 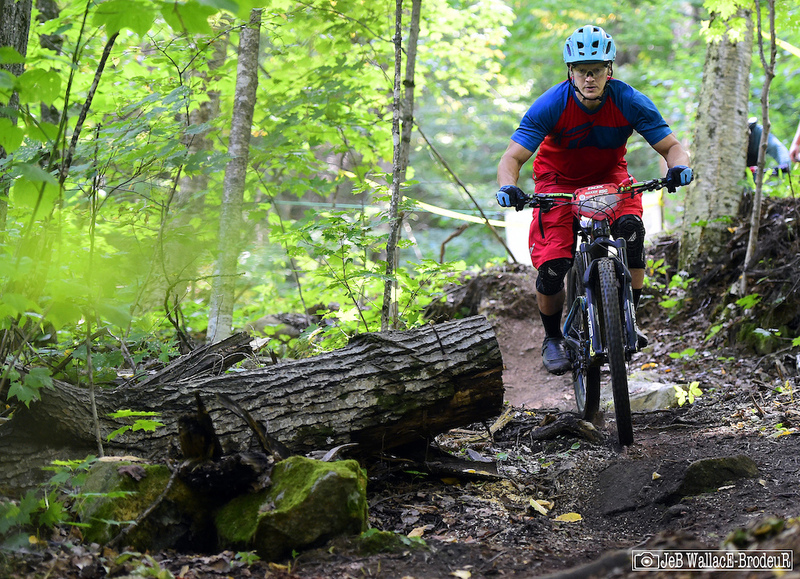 Alec Suriyuth aired it out and took home 5th place in the CLIF Enduro East overall. Adam Morse was Rude's closest competitor after day one, taking two stage wins and finishing just two seconds back for the day. That all changed in a heartbeat on stage six when Morse misjudged his speed into this jump and got wadded on a big wet root. With his derailleur caught in his spokes Morse lost more than minute on the stage but still rallied to take the final podium spot for the event. The bottom of Rude Awakening is death grip terrain as the the trail plumb lines to the exit road. Bicycle Express pro Kelly Ault, one of the few moms in the field, ripped through the tall grass at speed. Racers got a brief reprieve on the next leg as they only had to climb half way up the mountain to stage seven, the shortest descent of the weekend. 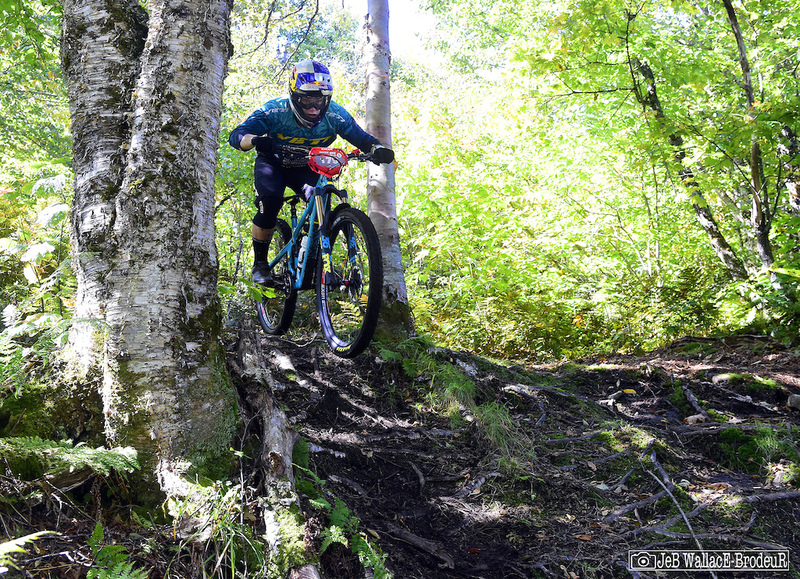 Jason Scheiding dominated the EWS Masters class winning six of the eight stages and taking the overall by 31 seconds despite suffering a violent crash on stage four that left him with bruised ribs. 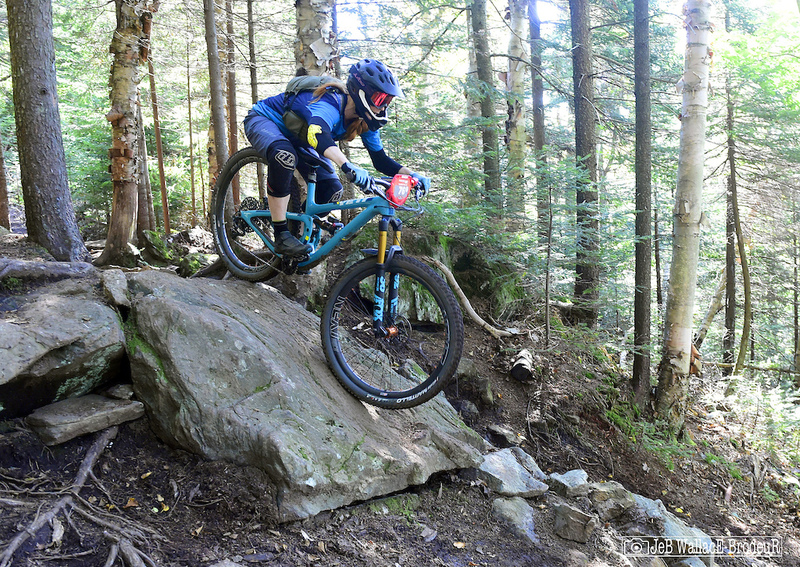 Canadian ripper Adam Robbins scored a top-ten finish at the Whistler EWS stop in the U21 class but has been competing in the EWS mens class on the Enduro East tour scoring a win at Mountain Creek and a 4th-place finish at Burke. Canadian XC specialist Rebecca Beaumont held a commanding lead after the first day of racing but the technical downhills of day two proved her undoing as she dropped back to third for the weekend. The final stage on Upper J-Bar was an absolute technical beast. 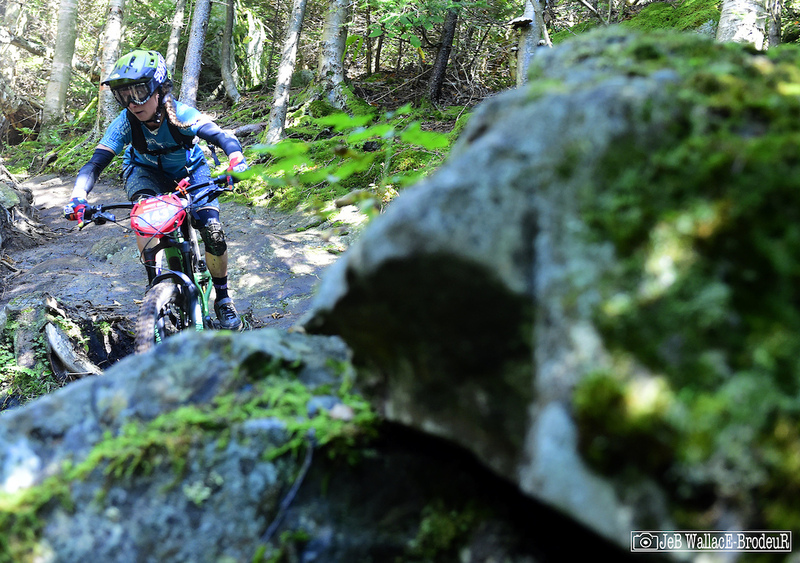 Steep and slick, the rocky jumble of a trail took no prisoners on Sunday with countless riders crashing or running their bikes through sections. 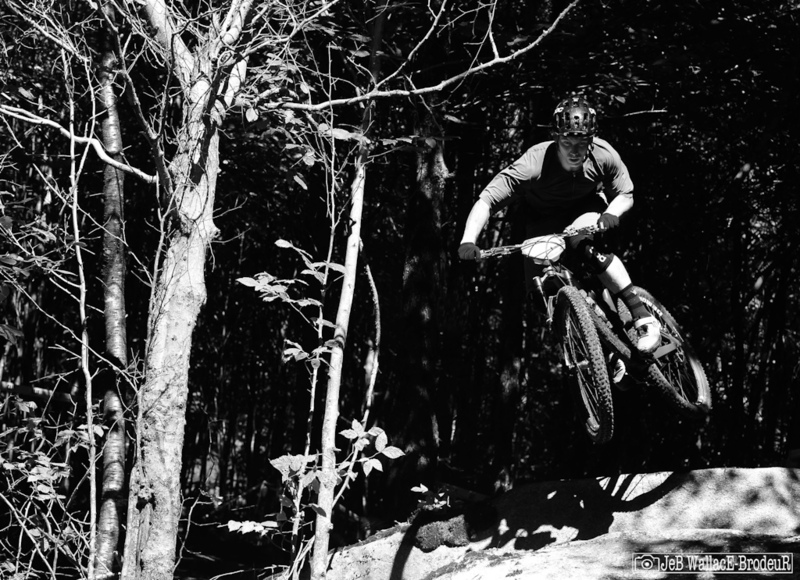 This off-camber slab was a particularly thorny spot, removing countless riders from the saddle. Perhaps the biggest story line of the event was the triumphant return of Alison Zimmer to the racing scene. 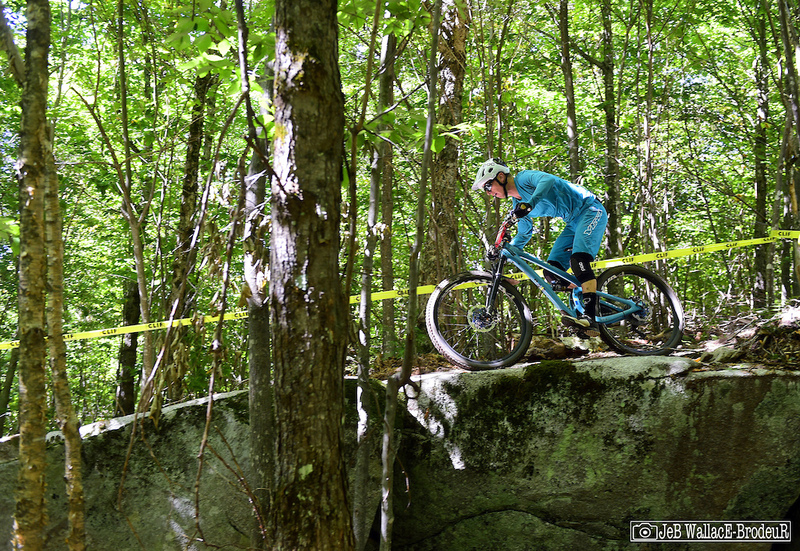 Zimmer was a hugely successful east coast racer, winning a ProGRT and qualifying for World Cup downhills and competing at World Championships in Norway. Zimmer abruptly left the scene four years ago, almost to the day, to pursue a physical therapy business and raise her daughter. 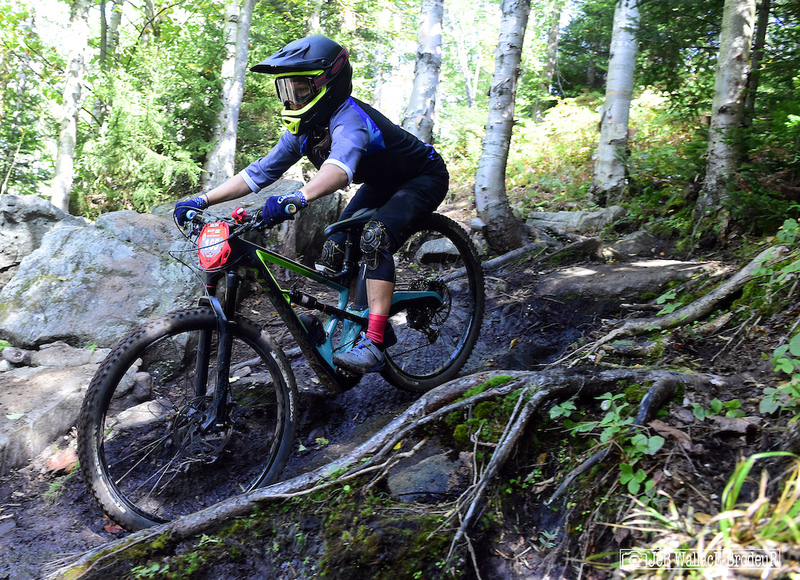 She clearly hasn't lost her DH chops as she entered day two in third place and crushed stages six and eight to leap frog up to the win by a seven-second margin. Canadian Danick Guilbaut took five of seven stages to capture the amateur U17 crown by nearly 27 seconds. Amy Morrison kept her streak of runner-up finishes alive and took the overall EWS North American title with a well-rounded performance. Morrison won one stage and was in the hunt on every other to finish just off Zimmer's pace. Kim Quinlan was consistently fast all weekend as usual and earned the fourth step of the podium when all was said and done. The final category winner was young Riley Miller in the amateur women's class. 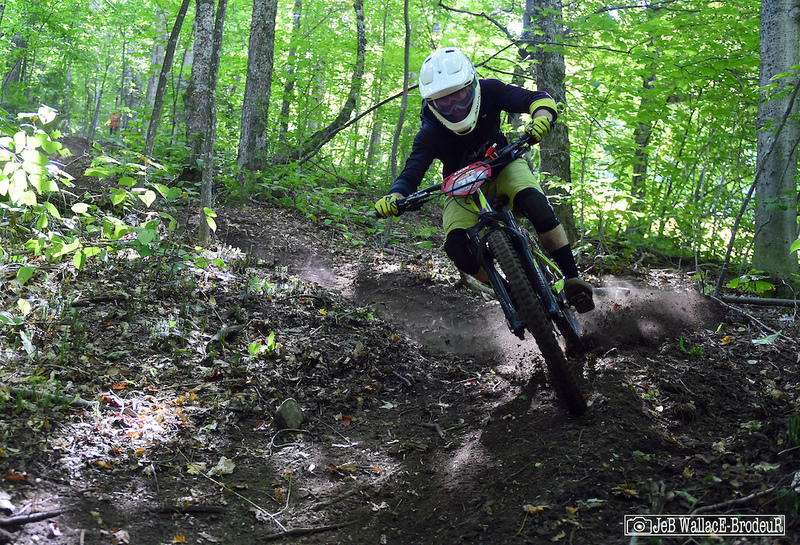 Miller trains on the local IdeRide kids race team and is one to keep an eye on in the future. The same five riders that lead the standings after day one remained there after day two but there was some reshuffling. 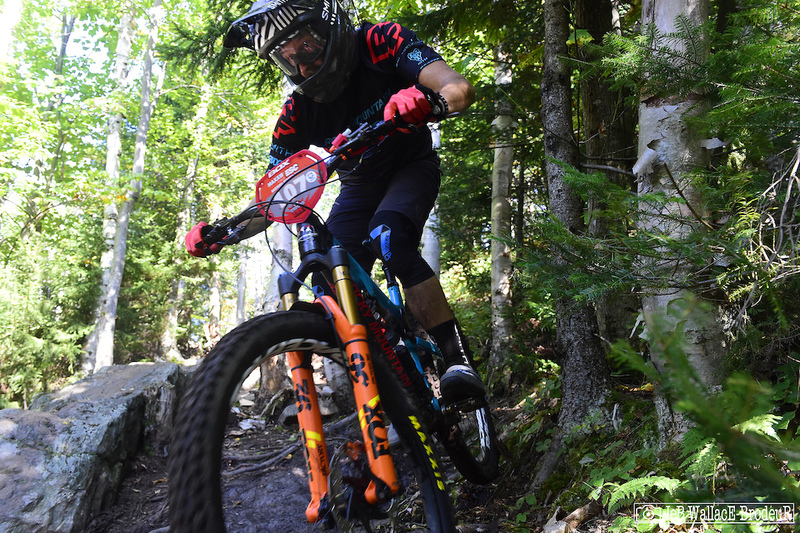 The biggest move was by Race Face/ Rocky Mountain Enduro Team rider Peter Ostroski who jumped from fourth to second thanks to two seconds and a win on the final stage. 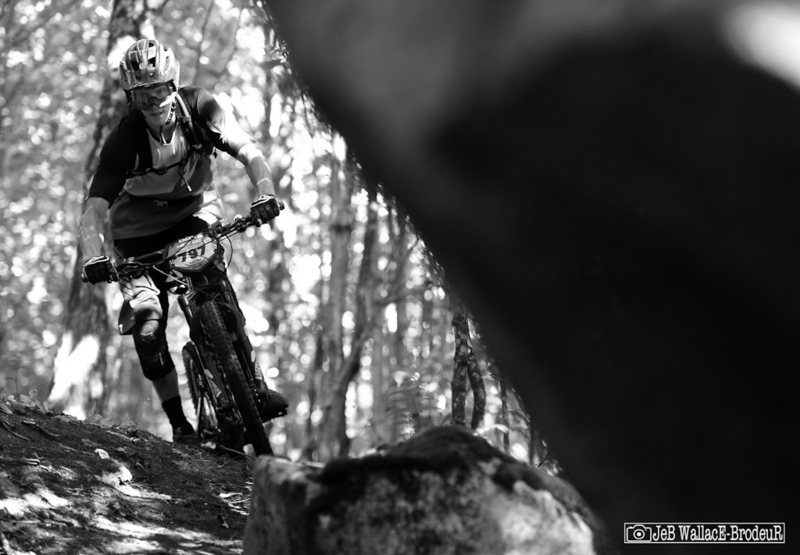 Ostroski is one of the lucky few heading for the Trans-Cascadia race in a few days. There's a hint of color in the trees and its clear the racing season is starting to wind down. Congrats to all those that punched a ticket into the big EWS dance next season and to everyone who finished smiling! Great job by the ESC Crew, Adam Craig and Knight IDE for putting on two days of great racing at VH and Burke. The stages where long and challenging while the transfers where brutal. Now I know what it takes to be a World Class Enduro Rider. A proper finish to 2 great series! 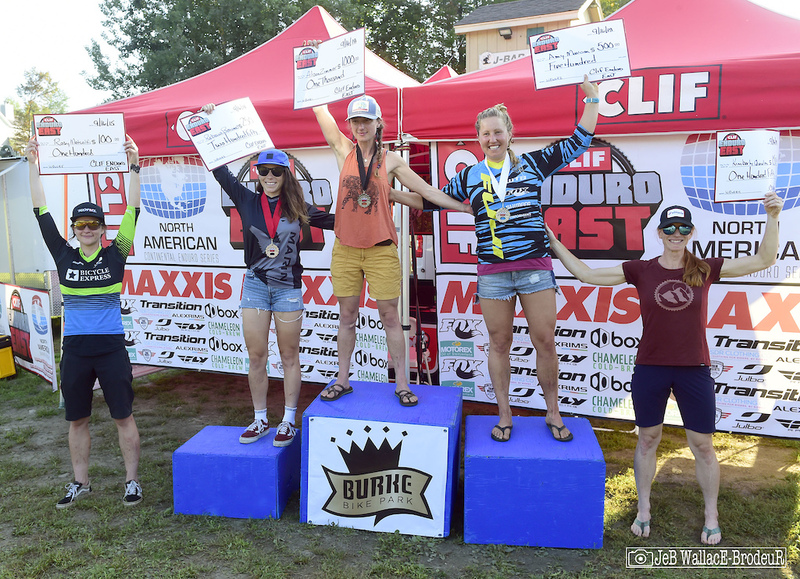 Burke and Victory Hill delivered 2 epic days of racing. Congrat to everyone who finished and thank you for making it the best event we’ve ever had. Cheers to bigger and better things to come in 2019. 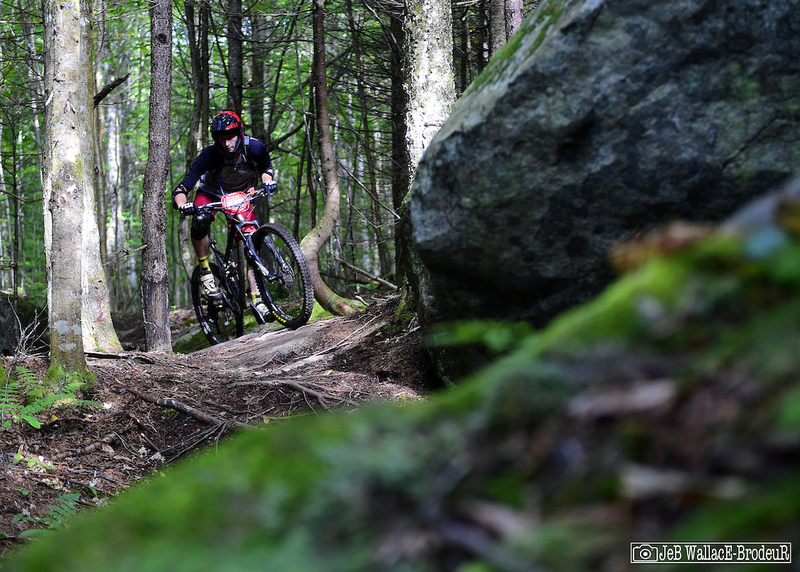 I’ve never done an EWS but now I know what it must feel like to compete in one. This was truly a world class event with incredibly challenging but fun stages. Truly epic weekend!!! Thanks for putting on a great event! Nice write up Jeb! Great event. It was well organized and the trails were first class. Really impressed by all of the riders and how strong the East Coast riders are. Awesome Weekend, thank you !! Really need a stop in the PNW or Western Canada. 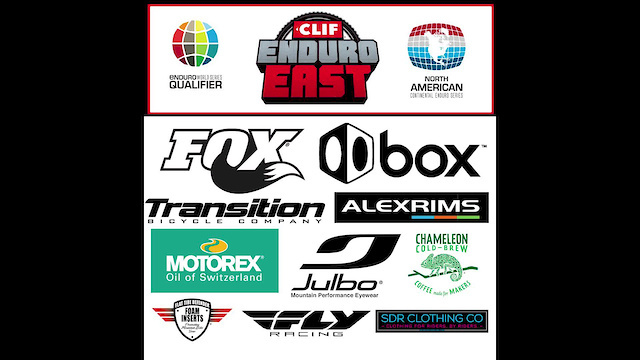 How the hell do you have a continental EWS series and not have a stop in the heart of mountain bike country? @jayacheess: That's easy, by not having any promoters willing to take on the task. Too busy riding mountain bikes.